Antibiotic multiresistant microbes represent a challenging problem. Because honey has a potent antibacterial property, the antimicrobial effects of different honey samples against multiresistant pathogens and their compositions were investigated. Five honey samples were used: Talah, Dhahian, Sumra-1, Sidr, and Sumra-2. Samples were analyzed to determine chemical composition such as fructose, glucose, sucrose, pH, total flavonoids, total phenolics, hydrogen peroxide concentration, minerals and trace elements. Antimicrobial activities of the samples against 17 (16 were multiresistant) human pathogenic bacteria and three types of fungi were studied. Specimens of the isolates were cultured into 10 mL of 10–100% (volume/volume) honey diluted in broth. Microbial growth was assessed on a solid plate media after 24 h and 72 h incubation. The composition of honey samples varied considerably. Sumra 1 and 2 contained the highest level of flavonoids and phenolics and the lowest level of hydrogen peroxide, whereas Dhahian honey contained the highest level of hydrogen peroxide. Sixteen pathogens were antibiotic multiresistant. A single dose of each honey sample inhibited all the pathogens tested after 24 h and 72 h incubation. The most sensitive pathogens were Aspergillus nidulans, Salmonella typhimurum and Staphylococcus epidermidis (S. epidermidis). Although there was no statistically significant difference in the effectiveness of honey samples, the most effective honey against bacteria was Talah and against fungi were Dhahian and Sumra-2. Various honey samples collected from different geographical areas and plant origins showed almost similar antimicrobial activities against multiresistant pathogens despite considerable variation in their composition. Honey may represent an alternative candidate to be tested as part of management of drug multiresistant pathogens. Propolis is a natural product that has been known and used by man for centuries. It is mainly because man learnt relatively early to exploit the products of domesticated honeybee. Recorded use of propolis dates back to c. 300 BC and continues today in the form of home remedies, toothpastes, creams, ointments, drops, and dietary supplement. Its numerous properties have been appreciated for very long time. However, despite numerous studies conducted all over the world so far, the constitution of propolis remains largely unknown. It requires further research that may lead to new discoveries of its composition and possible applications. Propolis is a gum gathered by honey bees from various plants; the honey bees use propolis to seal holes in their honey combs, smooth out the internal wall and protect the entrance against intruders. It is composed of 50% resin (flavonoids and related phenolic acid), 30% wax, 10% essential oils., 5% pollen and 5% various organic components. As a natural mixture, propolis is widely used in medicine and cosmetics and food. So far no attempts have been yet made to make use of propolis in the realm of textile finishing . Current work presents the first systemic study targeted to build up a scientific basis for production of cotton textiles having antibacterial activity and other useful properties by making use of propolis as eco-friendly finish within the scope of green strategy. Propolis extract solution (70/30 ethanol/water) of 10% concentration was prepared as the stock. Different amounts of the latter were used along with a crosslinking agent and catalyst for treatment of cotton fabrics as per pad-dry-cure technique. Antibacterial activity of the so treated fabrics was obtained through monitoring the efficiency of the interaction of propolis with cotton cellulose. This interaction was expressed as inhibition zone diameter after the treated fabrics were exposed to (G +ve) and (G-ve) bacteria . Other properties include crease recovery, tensile strength and elongation at break. Factors affecting these properties such as type, nature and concentration of the crosslinking agent, concentration, of propolis, and conditions of curing were investigated. 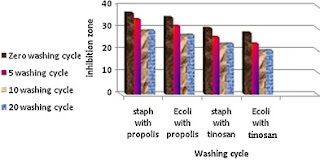 In addition characterization of the propolis containing modified cotton fabrics including demonstration of the antibacterial activity, SEM, FTIR, durability to washing, UV protection and water repellency were performed. 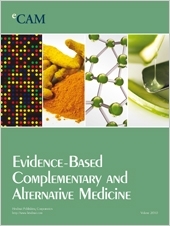 Based on results obtained, it is concluded that application of propolis along with glyoxal and Al2(SO4)3 catalyst using pad-dry (3min./80°C), cure(5/140°C) bring about cotton textile with superior antibacterial activity, water repellent and ease of care characteristics as well as UV Protection. Tentative mechanism of the reaction of propolis with cotton in presence of glyoxal was also reported.